Binbrook is a village and civil parish in the East Lindsey district of Lincolnshire, England. It is situated on the B1203 road, and 8 miles (13 km) north-east from Market Rasen. East Lindsey is a local government district in Lincolnshire, England. The population of the district council was 136,401 at the 2011 census. The council is based in Manby near Louth. Other major settlements in the district include Alford, Spilsby, Mablethorpe, Skegness, Horncastle and Chapel St Leonards. James Fowler JP, FRIBA, known as 'Fowler of Louth', is best known as a Victorian English church architect and associated with the restoration and renovation of churches. However, he was also the architect of a wide variety of other buildings. A listing of his work compiled in 1991 traced over 210 buildings that he designed or restored. He is known to be the architect for 24 new churches and his work also included 40 vicarages or rectories, 13 schools, four almshouses, a Savings Bank, a Convalescent home and hospital as well as country houses and estate housing. Most of Fowler’s work was in Lincolnshire and particularly around Louth, but it also included work in the East Riding of Yorkshire, Nottinghamshire, Staffordshire, Suffolk, London, Sussex and even Devon. Binbrook is close to the site of Binbrook Airfield, originally opened as RAF Binbrook; the airfield housing is now the new village of Brookenby. Royal Air Force Station Binbrook or RAF Binbrook was a Royal Air Force station, now closed, located near Binbrook, Lincolnshire, England. The old domestic site has been renamed to become the village of Brookenby. RAF Binbrook was primarily used by Bomber Command in World War II. After the war it was amongst others the home of the Central Fighter Establishment. It also served as base for the last two RAF squadrons to employ the English Electric Lightning between 1965 and 1988. Brookenby is a village and civil parish in the West Lindsey district of Lincolnshire, England. The village is situated 7 miles (11 km) north-east from Market Rasen. According to the 2001 census, it had a population of 742, falling to 665 at the 2011 census. Fotherby is a village and civil parish in the East Lindsey district of Lincolnshire, England. It is situated just east from the A16 road, 13 miles (21 km) east from Market Rasen, and 10 miles (16 km) south from Cleethorpes. An abandoned village is a village that has, for some reason, been deserted. In many countries, and throughout history, thousands of villages have been deserted for a variety of causes. Abandonment of villages is often related to epidemic, famine, war, climate change, environmental destruction, or deliberate clearances. A priory is a monastery of men or women under religious vows that is headed by a prior or prioress. Priories may be houses of mendicant friars or nuns, or monasteries of monks or nuns. Houses of canons regular and canonesses regular also use this term, the alternative being "canonry". Minting is a village and civil parish in the East Lindsey district of Lincolnshire, England. The village is situated 1 mile (1.6 km) south from the A158 road. The population at the 2011 census was 286. 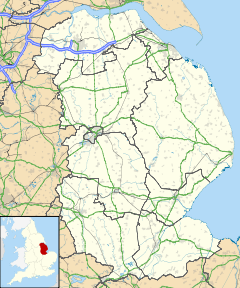 Broughton is a small town and civil parish situated on the Roman Ermine Street, in the North Lincolnshire district of Lincolnshire, England. The population of the civil parish at the 2011 census was 5,726. It is situated approximately 2 miles (3 km) north-west from the town of Brigg. The hamlets of Wressle, Castlethorpe, and part of Scawby Brook lie within the parish boundaries. Deeping St James is a large village in the South Kesteven district of Lincolnshire, England. The population of the civil parish was 6,923 increasing to 7,051 at the 2011 census. Burwell is a small village and Civil parish in the East Lindsey district of Lincolnshire, England. It is situated on the A16 road, and north from Spilsby. The village covers approximately 2200 acres (9 km²). Fleet is a village, civil parish and electoral ward in the South Holland district of Lincolnshire, England. It lies on Delph Bank, 3 miles (4.8 km) south-east from Holbeach. The population of the civil parish, including Fleet Hargate, at the 2011 census was 2136. Belton is a village and civil parish in the Isle of Axholme area of North Lincolnshire, England. It is situated on the A161 road, and approximately 6 miles (10 km) east from Scunthorpe. To the north of Belton is the town of Crowle; to the south, the village of Epworth. Langtoft is a small village and civil parish in the East Riding of Yorkshire, England. It is situated 6 miles (10 km) north of Driffield town centre, and on the B1249 road between Driffield and Foxholes. Freiston is a village and civil parish in Lincolnshire, England. The population of the civil parish at the 2011 census was 1,306. It is situated approximately 2 miles (3 km) east from Boston. The Greenwich Prime Zero meridian line passes between the village and Hobhole Drain. Cammeringham is a village and civil parish in the West Lindsey district of Lincolnshire, England. It is situated 6 miles (10 km) north from the city and county town of Lincoln, and just off the A15 road near RAF Scampton. According to the 2001 Census the village had a population of 123, increasing slightly to 127 at the 2011 census. Faldingworth is a village and civil parish in the West Lindsey district of Lincolnshire, England. It is situated on the A46, and approximately 5 miles (8 km) south-west from Market Rasen. Spridlington parish lies to the west, and Friesthorpe parish to the south-east. Faldingworth parish covers just over 2,500 acres (10 km2). The 2001 Census recorded a Faldingworth population of 253, increasing to 400 at the 2011 census. Wilberfoss is a village and civil parish in the East Riding of Yorkshire, England. It is situated on the north side of the A1079 approximately 8 miles (13 km) east of York city centre and 11 miles (18 km) north-west of Market Weighton. According to the 2011 UK census, Wilberfoss parish had a population of 1,866, an increase on the 2001 UK census figure of 1,855. Ludborough is a village and civil parish in the East Lindsey district of Lincolnshire, England. It is situated approximately 5 miles (8 km) north from Louth, and at the eastern end of the A18 road. Ludborough has a population of 191 people. The Prime Meridian passes to the east of the village. Walesby is a village and civil parish in the West Lindsey district of Lincolnshire, England. The population of the civil parish at the 2011 census was 249. It lies in the Lincolnshire Wolds, 3 miles (5 km) north-east from Market Rasen and 7 miles (11 km) south from Caistor. Tealby parish lies to the south-east. The parish covers about 3,600 acres (15 km2) and includes the hamlets of Risby and Otby. South Kyme is a small village and civil parish in the North Kesteven district of Lincolnshire, England. The population of the civil parish at the 2011 census was 393. It is located 2.5 miles (4 km) south-east from North Kyme which is itself 2.5 miles (4 km) from Billinghay. Upottery is a small village, civil parish and former manor in East Devon, England. Legbourne is a village and civil parish in the East Lindsey district of Lincolnshire, England. It is situated about 3 miles (5 km) south-east of the town of Louth. The Greenwich Prime Zero meridian line passes through the village. Hundleby is a village and civil parish in the East Lindsey district of Lincolnshire, England. The village is a suburb of the market town of Spilsby. North Ormsby is a village and civil parish in the East Lindsey district of Lincolnshire, England. It is situated approximately 7 miles (11 km) north-west from the market town of Louth. ↑ "Parish population 2011". Neighbourhood Statistics. Office for National Statistics. Retrieved 18 August 2015. 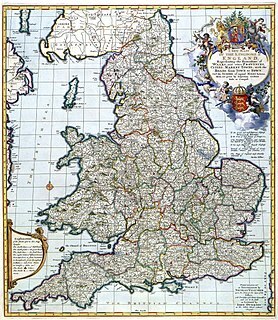 ↑ Historic England. "Church of St Mary and St Gabriel (1063134)". National Heritage List for England . Retrieved 29 June 2011. ↑ "Key Figures for 2011 Census: Key Statistics – Area: Binbrook (Ward)". Neighbourhood Statistics. Office for National Statistics. Retrieved 28 October 2016. ↑ Historic England (2007). "Orford (351872)". PastScape. Retrieved 10 April 2010.